← Happy Holidays to One and All! 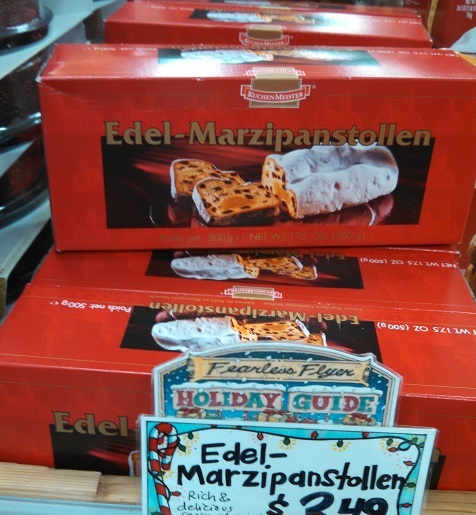 $3.49 – That’s a good price for Edel-Marzipanstollen! I think! 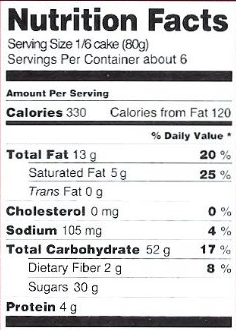 Rarely, as in very rarely, as in once a year or so, I review something available at Trader Joe’s but not made by them. Last year about this time we looked at the shocking Dutch ChocoVine, a blend of red wine and European chocolate. This year we look at something equally seasonal, and equally European – Edel-Marzinpanstollen. A soft, heavy, sweet loaf of bread filled with dried fruits, marzipan, citrus, loads of spices, and dusted with sugar. The result is something like a fluffier fruitcake. As you might guess from the long, unwieldy name, Edel-Marzipanstollen is German in origin. And, moreover, it’s as seasonal as seasonal can get. What do I mean by that? Well, put it this way – not only is it a traditional Hanukkah treat and a traditional Christmas treat, but also the Pope himself issued an edict to save them from being outlawed (by an earlier Pope). Now that’s a holiday tradition. Let’s start at the beginning – distant medieval Germany, AKA the Fun Zone. Back in middle of the dark ages, in the Saxony region of north-eastern Germany, people decided what the hell, let’s start baking a bread-like fruit cake and fill it with all the sweet tasting goodies we can get our hands on. This came to mean including candied orange and lemon peel, raisins, almonds, cardamom, cinnamon and, depending on taste, marzipan – as in the version we’re trying today. The resulting product, called stollen in it’s most generic form, was originally of Jewish origin, and was eaten throughout the Hanukkah season. The neighboring gentiles, recognizing a good idea when they saw one, adopted it for their own Christmas celebrations sometime there after. However, despite its popularity among Christian laity, the Pope was having none of it. Tasty Christmas breads we’re one casualty of medieval Advent traditions – namely the tradition of fasting, which forbade (among other things) using butter in baking. A stollen isn’t really a stollen if it isn’t absolutely slathered with butter to ensure tasty, moist bread and a long shelf life. Forced to use oil as a surrogate, the resulting stollens were much less palatable – harder, crustier, and bland. The Saxons did not take the loss of the stollen sitting down. You might have a Christmas tradition you hold dear – you might be prepared to fight for it, but are you prepared to fight five Popes to the death for it? The Saxons were. Starting in the mid-1400’s, two Saxon nobles began sending letters to Pope Nicholas V campaigning for a special dispensation for their bakers to use real butter over Christmas. These letters were summarily ignored until Nicholas’ death – when his successor Callixtus III took over. Callixtus, a very different sort of Pope, nevertheless continued to refuse the request until he died. The post then fell to Pius II, who wanted nothing to do with the butter request and shot it down again. This pattern continued until 1490 when Pope Innocent VIII finally gave in – allowing butter to be used once more. The stollen was saved. Knowing all this, you might feel more inclined to pick up this sweet bread – but the big question remains – how does it actually taste? Well, as I suggested way back up at the top of the page, Edel-Marzipanstollen is a lot like fruitcake, only better. I’m aware that’s not saying a lot, given the low regard fruitcake is held in, but the comparison stands. Many of the same ingredients you find in your standard, sticky heavy fruitcake are found here too. The biggest difference is that instead of being crammed into the densest possible wad, they’re given room to breathe in a fluffy, moist, cake-like bread. This bread isn’t sweetened directly – all of the sweetness comes from the sugary fruits and nuts, and the dusting of confectioners sugar on top. This lighter texture makes it much friendlier and more snackable when compared to fruitcake. Nevertheless, the taste is still very similar. If you’ve had one slice of bread filled with candied produce, you know what to expect here. The biggest difference is in the large pieces of marzipan placed throughout. Soft, sweet, and about the size of walnuts, they insert some welcome variety into the otherwise predictable fruit bread. Overall, despite the unusual name, there isn’t anything in this stollen that you haven’t seen before. If you have a tradition of buying holiday fruit breads, this is a good one, pleasantly heavy and soft, with plenty of candied sweetness. However, if you can get along well enough without fruitcakes or their kin, there’s nothing here that is going to make you change your mind. Still, it’s only $3.50 for a fine, big loaf – and that’s not a bad price for a piece of ancient holiday history. If the spirit of the season happens to overtake you one fine day as you browse the aisles, why not pick it up and see what all the fuss was about? Would I Recommend It: Not really, unless you have a particular fondness for holiday fruit breads or feel buoyed up by holiday cheer. Would I Buy It Again: Probably not, I’ve had it once – my curiosity is satisfied. Final Synopsis: A fluffier, moister variety of fruit cake with a rich history. Thanks for the mini history lesson – the history of food, especially traditional kind, can be fascinating! Having been raised on British fruitcake (a much more palatable fare than the ghastly, inedible thing that passes for fruitcake in America), my palate developed with a taste for the blend of spices and fruits used in this particular stollen, so let me just add my vote for it. The marzipan makes it even better. It’s close in taste to the traditional English Christmas cake, only much easier to come by (and less expensive, since Christmas cakes are only available in import stores around here). So I would suggest trying this WITHOUT the thought of American fruitcake in your mind, because while the spices are similar, that is where the similarity ends. It’s a much lighter, less sickly-sweet European taste. Just right with a cup of coffee or tea.